With many thanks to Mr. Bierce, Mr. Swift, Mr. Pope, and others, Classical Candor takes a tongue-in-cheek look at audiophile nomenclature with our own "terms of endearment." Amplification: The ability of a writer to phrase trivial ideas in pompous, grandiose, overbearing, bombastic, authoritarian, redundant, and often repetitious style, thereby convincing readers that anyone who sounds so important must be right. Articulate: To voice an opinion. But not too loudly. See "Discussion." Audiophobe: (1) A person who loves the sound of stereo equipment more than the sound of music. (2) A person who spends more time reading about audio than listening to it. (3) A person whose opinions on sound reflect those of his current guru. For further information, read "Fear of Listening" by I.M. Deef. Audiophile: A tool used by the audio elite to scrape away the cherished beliefs of others. "Blows it away": Sounds different. See "Breathtaking," "Super," "Extraordinary," "Ultra good," "Incalculably better," "Superior in every way," "Knocks your socks off," and, most important, "More expensive." Boomy: The voice of God or the voice of one's favorite audio reviewer, whichever comes first. Compact disc: A small, circular, silver plate said by some to contain music but used mainly to provide background noise while doing daily chores. See also "Pirate." Crossover: (1) Giving up hi-fi and buying a digital camera. (2) Giving up digital cameras and buying an MP3 player. (3) Giving up MP3 players and buying a multimedia computer. (4) Giving up multimedia computers and buying a home theater. (5) Giving up home theater and reading a good book. DAT: The EQ of a DCC's IM and THD, calculated as the balanced fiber optic oversampling of a 12 kHz coaxial migraine at a maximum impedance of twelve supra-aural anechoic Ohms, filtered to V rms. SPL. LS. MFT. D/A converter: One who changed his hairstyle in the sixties but kept his music intact. Digital: (1) Viewed by some authorities as sweetness and light, the hope and salvation of the world. (2) Viewed by others as the Evil Empire, the Dark Side. Discussion: Outside the audiophile community a term denoting the exchange of ideas. Within the audiophile community a euphemism meaning, "You say whatever you want, but I'm right." Dolby: The man who invented sound. Dynamic range: The magnitude and authority of a voice in the audio world, determined largely by the size of the advertising budget and/or the scope of the circulation. Equalization: The law of opposing views, which states that after reading two or more reviews of the same subject, the reader will be no further ahead than he was before. Equalizer: Also known as the Great Equalizer; i.e., money. Expert: One whose opinion appears in print. Fatiguing: Reviewers, including yours truly. Golden-eared reviewer: A writer whose hearing is infinitely better than everyone else's, because he says it is. Golden retriever: The only listener whose hearing has never been in doubt. High end: (1) The uppermost limit of reproduced sound, capable of being heard only by dogs and audiophile reviewers. (2) Anything that costs a lot. Hi-Fi: (1) A greeting among members of the audiophile community, meaning "high five" or "gimme fi'." (2) The salutation commonly used when addressing the group of five composers who in 1875 united their efforts to create a national school of Russian music. Jargon: Specialized language, vocabulary, argot, lingo, patter, cant, palaver of the field; generally employed to cloud the fact that the writer doesn't know what in the hell he's talking about. Loudspeaker: The guy with the biggest mouth or the most impressive credentials. See "Amplification." LP: A long time ago in a galaxy far, far away, it is said people used to play music from these large, round, flat, black-vinyl discs. It is supposed that the medium was accessed by simultaneously spinning the LP on a circular table while scraping it with a piece of sharp-pointed metal. Curiouser and curiouser. Such artifacts have recently been found and are being replicated by several manufacturers for further investigation. Also great as Frisbees. Masked: What some audio dealers and manufacturers should be when they ask the prices they do. Mellow: The sound of any hi-fi system after several glasses of Chardonnay. Noise reduction: (1) The exclusion of anyone from a listening room who begins talking the moment music plays. (2) The exclusion of "experts" from the listening room. Open: Tell-it-like-it-is honesty in the halls of esoteric, high-end audio. See also "Edgy," "Tight," "Pinched," "Muddy," "Hollow," "Strident," "Rude," "Boorish," "Churlish," "Uncouth," "Barbaric," "Duplicitous," and "Sneaky." Opinion: An accepted misnomer, implying that audiophiles actually have their own views. Platter: An antique black-vinyl disc used to play music, now used mainly to carry roast beef and potatoes. Point of view: "I'm right; you're wrong." See "Expert." Presence: The stereo gear you got for Christmas. Receiver: The guy who takes the cash. Not to be confused with the listener, who shells it out. SACD: What happens to audio salesmen who don't know the jargon. Second order harmonic distortion: SOHD. Derogatory remark, chiefly British, made when the hi-fi acts up or the wife complains. State-of-the-art: The biggest or most-expensive stuff. Stereo: The reproduction of sounds through both sides of the face; see also "forked tongue." Surround sound: An audiophile gathering with everyone talking at once and nobody listening to the music or to anybody else. Third order harmonic distortion: TOHD. (1) Speakers angled toward the primary listening position. (2) Parent or adult who constantly nags, "Turn it down!" Tuner: An American media mogul, founder of CNN and owner of several TV stations and a baseball team; formerly married to Jane Fonder. Tweak: To wring from a component the last ounce of perceived performance; proof positive that nobody or nothing is perfect. Francois-Frederic Guy, piano; Philippe Jordan, Orchestre Philharmonique de Radio France. Naive V 5084. Judging by their pictures on the back cover and within the booklet insert, both pianist Francois-Frederic Guy and conductor Philippe Jordan appear to be relatively young men. It is fitting, therefore, that their performances should be filled with youthful enthusiasm and unbridled zest. Not that the performers aren't mature and understanding as well, but they display a spark often missing in recordings of Beethoven's concertos. In a booklet note Guy mentions pianists like Schnabel, Fischer, Kempff, and Brendel as having created the cornerstones of modern Beethoven piano concerto recordings, but, in fact, Guy's performance most resembles those of the younger Kovocevith or Ashkenazy, which is not a bad thing at all. Guy also mentions that he wanted to pair up the First and Fifth Piano Concertos to show how far Beethoven had gone from his first to his last entry in the field. Then on the next page of the booklet in an essay by Beate Angelika Kraus, the author tells us that the First Concerto was not really Beethoven's first in this field at all but his third, the composer having written as a teenager an earlier piano concerto that never got an opus number and having never actually finished No. 1 until after he had completed No. 2. Well, I don't think it makes much difference. Guy's point is still well taken, and there are striking differences in Nos. 1 and 5, which Guy effectively points up in his interpretations. The First is, of course, full of the same youthful enthusiasm I mentioned the two performers possessing, so it naturally comes off with an appropriate spark. Concerto No 5, the "Emperor," is done up in the grand manner, yet it is not without a movingly lyrical slow section nor without strong poetic feeling in the lighter moments of movements one and three. It may not displace Kovacevich or Kempff as top contenders in this repertoire, but it is a contender. However, when you factor in the well-focused Naive sound, the competition for best "Emperor" recording gets even closer. There is an excellent dynamic range and impact to the sound, the piano is beautifully balanced, and the detailing is superb. I found the stereo spread a bit less expansive than I liked, but that may have only been in comparison to most of the other recordings I've mentioned. The bass end is also a mite lean, which helps bring out the recording's transparency but doesn't provide quite as much weight as I'd prefer. Still, all things considered, this 2007 Naive recording is probably one of the best all-around releases on the market right now. So, highly recommended. Mariss Jansons, Bavarian Radio Symphony Orchestra and Chorus. BR Klassic 403571900102. Joseph Haydn (1732-1809) composed half a dozen masses in the last years of his life, the so-called "Harmony Mass" among his final creations in 1802. 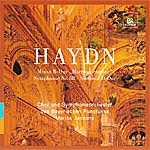 It is the centerpiece of this program of Haydn works by conductor Mariss Jansons and the Bavarian Radio Symphony Orchestra. But before the Mass, we start out with the Sinfonia in D major, 1a:7, which the composer used several more times as an opera overture and as a movement for a couple of symphonies. It's a mildly attractive tune, if more than a little forgettable. Next, we get Haydn's Symphony No. 88, which is slightly more satisfying thanks to Jansons's lively beat and frothy bounce. The conductor brings out the work's dance rhythms nicely, although he takes the outer movements a bit too briskly at times for my taste. Then we come to the main attraction, the star of the show, the Mass in B flat major, known as the "Harmony Mass" for its large-scale scoring of wind instruments. It's a grand combination of classical symphonic style and Baroque choral fugues of which Jansons makes the most. He persuades his soloists and choir to sing robustly yet expressively, projecting a delightfully grand-scale account of the activities. What's more, you'll even hear echoes of Mozart's operas in here, making the Mass more than a mere accompaniment for a church service but a charming piece of stand-alone music. The snag in the proceedings is that BR Klassics recorded the 2008 album live in the enormous Waldsassen Basilika, which is quite reverberant, making the sound bigger, more resonant, more billowy, and less transparent than necessary. Worse, we get an outbreak of applause after each work to distract us from the purely musical enjoyment of the program. Still, the recording probably captures the acoustic of the cathedral pretty well, meaning in a highly reflective, somewhat veiled manner. Giuliano Carmignola, violin; Andrea Marcon, Venice Baroque Orchestra. DG Archiv 477 6606. DG's Archiv Production label has been making fine recordings for many years, giving us some of the best Baroque and classical music the catalogue has to offer. Among their latest efforts is the album Concerto Italiano, consisting of four lesser-known eighteenth-century Italian violin concertos. How "lesser-known" are they? Three of the four concertos had never been recorded before. All of the works are by composers who were also virtuosic violinists. Such is the fleeting nature of fame that their names are almost forgotten today, but in their own time these artists wrote scores of sonatas and concertos and would travel the length and breadth of Europe performing their works and those of other famous artists. The program begins with the Violin Concerto in C major by Domenico Dall'Oglio (c.1700-1764), which features an especially felicitous closing Allegro but is otherwise fairly routine. Next is the Violin Concerto in G minor by Michelle Stratico (1728-after 1782), a more creative work than the preceding one, more melodic, with a greater variety to the tunes employed. Here, we find a zippy opening; a serene, if somewhat somber, middle section; and a relatively dramatic finale. Next, we get the Violin Concerto in G major by Pietro Nardini (1722-1793), which simply sounds bigger than the first two concertos, grander, more ambitious, yet which by its conclusion we recognize is filled with high good spirits. Saving the best for last, however, is the most-popular concerto of the foursome and the only one to have been recorded previously, the Violin Concerto in C major by Antonio Lolli (c.1725-1802). The booklet note describes it as a forerunner of and a possible inspiration for the later work of Paganini, whose own Violin Concerto No. 1 remains, of course, one of the mainstays of the classical violin repertoire. One can certainly hear the similarities in Lolli's piece and Paganini's in their bouncy turns and radiantly charming manner. 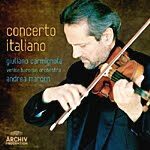 To bring off these long-neglected works we need a virtuosic violinist in his own right, and we get that in Giuliano Carmignola, ably supported by the Venice Baroque Orchestra, an ensemble of about sixteen players. Performing on a 1732 Stradivarius, Mr. Carmignola displays all the technical skill and fluency necessary and does so with precision and élan. If there is any snag to the proceedings, it's the recording, which the engineers miked quite closely. The violin takes pride of place, up front and center, but the accompaniment is spread out behind and beside him across the sound stage in seemingly a straight line. This arrangement allows for little depth or hall ambience, although it does offer clear, articulate sound with the instruments practically on top of the listener. Fortunately, the ear adjusts, and before long one is caught up in the music making and forgetting any minor shortcomings in the sonics. As a footnote, I might add that the disc offers a remarkable eighty-one minutes of music, one of the longest such timings for a single compact disc in my experience. In other words, you do get your money's worth. Adam Fischer, The Danish National Chamber Orchestra. Dacapo 6.220539. A dedicated Mozartian could probably identify all forty-one of the composer's symphonies from just a few bars. To me, the early symphonies all tend to sound alike, the variations so subtle that even after I had heard the four works on this Dacapo disc, I doubt that I could tell them apart if I listened to them again. That is not to say I didn't enjoy them, however. It had been many years since I had last heard anything but a late Mozart symphony, so it was a pleasure to again delight in their charms. 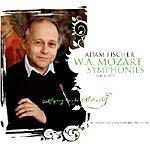 Maestro Adam Fischer appears on a mission to record all of Mozart's symphonies, with this collection of four from 1770-71 being the fourth volume in the series. Fischer works well with the Danish National Chamber Orchestra, a group just about the right compromise size for these pieces, considering that Mozart himself dealt with ensembles ranging from a handful of players to fifty or sixty at a time performing his symphonies. Fischer appears genuinely to love the music, and his glad tidings are infectious. Mozart wrote the four works recorded here while he was in his mid teens, so they share a youthful vigor, a traditional four-movement arrangement, and, above all, brevity, the longest of the movements being about six minutes, the shortest less than two minutes. Things start with Symphony No. 12, all merry good cheer, with a momentary reflective repose in the middle. Then we get KV96, a bigger, bolder, and more bassy piece, or as the composer might have said, a more grandfatherly composition. The booklet note informs us that Mozart wrote all of these symphonies during and just after his performance trips to Italy, where he was probably influenced by the Italian fondness for bass at the time (double basses and violas, especially). This is particularly noticeable in KV96. Symphony No. 13 displays a greater sense of wonder and adventure than the first two, but with the same high spirits and featuring an Andante that is most delightful and a closing Allegro that sounds as though it might have later inspired Mozart in his Horn Concertos. Finally, from the very beginning of Symphony No. 14 we experience a sense of calm, calculated resolve, yet with a bouncy beat reminiscent of the composer's Magic Flute of several decades later. There is also a more pronounced sense of size, space, and breadth present than in the earlier symphonies, projecting a more ambitious design. Nevertheless, the music remains decidedly playful and generally amusing. Dacapo's studio sound, recorded in 2009, is pleasantly smooth, warm, and alive, without being entirely state-of-the-art (despite the SACD capabilities of its CD/SACD compatible format). It seems to do everything right, sounding quite natural, yet it lacks those final "wow" factors that audiophiles enjoy, like ultimate impact and transparency. Music by Pierre Jalbert, Stacy Garrop, Vivian Fung, Lita Grier, and Zhou Tian. Cedille Records CDR 90000 115. William "Billy" Collins (b. 1941) is a best-selling American poet who served as the Poet Laureate of the United States from 2001 to 2003. He is a writer of uncommon sensibility and most common sense. Chicago's Music in the Loft chamber series and its founder, Fredda Hyman, decided it might be a nifty idea to ask various composers to set some of Collins's verse to music, and the result is the Suite by five different people we have here, premiered in 2008, just before this recording. The music displays a wide variety of moods and styles, while the words of Collins provide the glue that holds it all together. Things begin with "The Invention of the Saxophone," a twelve-minute, tongue-in-cheek poem set to music by Pierre Jalbert. It's done as a trio, with a narrator, piano, and, of course, sax, set to a soft, dreamy, jazzy score. It gets a little rambunctious toward the middle and then returns to a more serious, languorous calm by the finish. The next section of the Suite is called "Ars Poetica" ("Art Poetical"), four passages set to music by Stacy Garrop. This time the melodies are more intimate, reflecting grief, joy, and a bit of whimsy, using mezzo-soprano, violin, cello, and piano. They are a bit more trying, but should hold some interest for fans of the poet. Following that is a three-movement piece by Vivian Fung with the titles "Insomnia," "The Man in the Moon," and "The Willies," arranged for clarinet, cello, piano, and narrator. They are a good deal less portentous than the preceding work and offer a nice contrast to it, being little pictorial musical pieces vividly representing the Collins poetry in notes and harmonies. I enjoyed "The Willies," especially, highly accessible, cute, charming, and most entertaining. The two movements in Lita Grier's segment, "Forgetfulness" and "Dancing Towards Bethlehem," take us through a touching and sentimental landscape, with baritone voice, clarinet, and piano. Then the Suite ends with Zhou Tian's musical setting for "Reading an Anthology of Chinese Poems of the Sung Dynasty, I Pause to Admire the Length and Clarity of Their Titles." That's quite a mouthful for the title of so short a poem, but the music itself--for flute, harp, viola, and narrator--is the most delicate, lyrical, and beautiful of all the compositions in the Suite and provides a fitting conclusion to the proceedings. 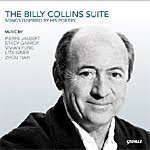 Any of the five sections of The Billy Collins Suite could easily stand on its own, and, indeed, that's how one might best listen to them. Each person will have his or her own favorites, surely, that will bear repeat listening. As always from Cedille, we get absolutely mesmerizing sound, for which we must again credit engineer Bill Maylone. 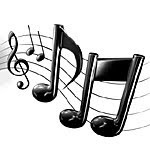 Voices are sweet and natural, while instrumental accompaniments remain smooth, warm, and true. The sonics are never close, forward, or bright, but warm and realistic; just right, in fact. They fit the music. Radu Lupu, piano; Andre Previn, London Symphony Orchestra. LIM XR24 012. 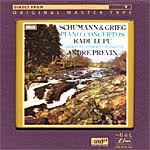 Robert Schumann's and Edvard Grieg's Piano Concertos in A minor form a part of that rarified group of Romantic piano compositions inhabited by the likes of Beethoven, Liszt, Tchaikovsky, and Rachmaninov. As a kid, I always got these works mixed up, each of them splendidly grandiloquent as they are. "Big," I think, is the operative word in describing them, and that is exactly the kind of performance we get in each work from pianist Radu Lupu, with Andre Previn and the London Symphony Orchestra in support. Yet these are not blustery, bombastic interpretations. They are full of life and vitality and incisive freshness, too. Lupu is not afraid of attacking the big crescendos with vigor, while applying the most gentle and sensitive touches to the poetic middle sections. If both the Grieg and the Schumann tend to wind down a bit after their memorable opening movements or lack something in strong orchestral writing, you can't blame that on Lupu, Previn, the LSO, or the LIM/Decca recording. It's the way they were written, not quite holding together to the very end the way Beethoven's "Emperor" does. But the Lupu team give it their best shot and produce felicitous results (although not, I don't think, quite as fetching overall as Stephen Kovacevich, with Colin Davis and the BBC Symphony Orchestra on Philips, who tends to be a bit more lyrical and refined while sounding just as big and dramatic). Anyway, to match the "bigness" of the music and the resplendent reading of Lupu and company, in 1973 Decca gave them a big recording, very wide and very dynamic, with the piano front and center. It's been a showpiece ever since, and now the folks at LIM (Lasting Impression Music, a part of Winston Ma's First Impression Music, FIM, group) have remastered it in the demanding XRCD/24 process that comes about as close as one can get to replicating the master tape. True to form, the sound is now bigger than ever, slightly fuller, and even more dynamic. Oddly, though, I didn't find the orchestral parts in either the original Decca recording or LIM's remastering quite as clear or transparent as the very best releases from these companies, especially LIM remasterings like the Albeniz Suite Espanola, Herold-Lanchbery La Fille Mal Gardee, or Mozart Divertimenti, which are pretty much state-of-the-art. And there are several brief instances on the Schumann/Grieg disc of low-end rumble, traceable, no doubt, to the master tape. No, what the Grieg and Schumann pieces do provide the listener, and why LIM chose to remaster them, I'm sure, is the kind of brawn that makes showing off one's stereo system so much fun. Again, however, don't expect night-and-day differences between this LIM remastering and Decca's own CD. For XRCD/24 masterings you pay a premium price for subtle distinctions, the kind that may not even show up on mid-fi audio setups. These are recordings for connoisseurs, and certainly for fans of the material. Leif Ove Andsnes, Norwegian Chamber Orchestra. EMI 50999 5 00281 2 2. 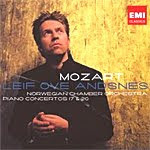 Hard on the heels of Leif Ove Andsnes's terrific EMI recording of the Grieg Piano Concerto is the pianist's addition of Mozart's Piano Concertos Nos. 17 and 20. They are no less impressive from a man who must now rank high on anybody's list of best pianists in the world. Concerto No. 17 comes across just as joyfully, cheerfully, zestfully, smilingly as one could want, leaving the listener elated and elevated for the experience. Then, No. 20, much the opposite in its initial seriousness, goes through its intentional metamorphosis, ending in the same ebullient spirit. Andsnes brings the appropriate gravity to the opening Allegro, the necessary sensitivity and refinement to the second-movement Romanze, and the aforementioned zest to the Rondeau variations of the closing. The disc leaves one wanting to start it all over again for an immediate second listen. EMI's sound, recorded in 2007, allows nothing to be desired, either. It captures both the Norwegian Chamber Orchestra, which Andsnes also leads, and the soloist most realistically, with weight, depth, breadth, and transparency. Occasionally, the piano appears a trifle too large, too wide, and there are instances where I thought the left-right balance seemed a tad off, but these are such minor concerns I really shouldn't even mention them. In short, count these as excellent performances in excellent sonic presentations all the way around. Porgy and Bess Suite; Piano Concerto in F major (excerpt); An American in Paris (excerpt); 3 Preludes. Arranged by Franck Villard. Michel Lethiec, Clarinet; Patrick Gallois, Sinfonia Finlandia Jyvaskyla. Naxos 8.570939. There's always something new in the classical-music field, you can depend on it, even when the "something new" is something old. In this case, it's Gershwin's music transcribed for clarinet and string orchestra, the clarinet being an apt instrument for Gershwin's flowing, free-spirited, jazz-inflected musical world. Franck Villard arranged these familiar songs and melodies, apparently quite recently although the booklet note doesn't say, and he does them no harm. 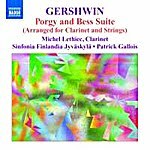 Of course, it helps to like the music of George Gershwin (1898-1937) and the sound of the clarinet to appreciate the album fully, yet even if you've never heard Gershwin before or haven't given the clarinet much thought, you might still like these arrangements. The performances are lively and colorful, a little different, to be sure, and highly entertaining. Things begin with a five-movement suite from the popular opera Porgy and Bess, and you'll find all the familiar songs here following the chronology of the story: "Summertime," "A Woman Is a Sometime Thing," "My Man's Gone Now," "I Got Plenty of Nuttin'," "It Ain't Necessarily So," etc. Villard does a welcome job making sure the clarinet replicates most of the vocal parts, and Michael Lethiec's clarinet playing is splendidly evocative. The five movements combine to form a suite over forty-three minutes long, so you get your money's worth. Of the accompany pieces, the Piano Concerto excerpt is my favorite, although the American in Paris excerpt is wonderfully expressive, too, and the three Preludes form a pleasant little mini-concerto. OK, if I have any qualm at all, it's that there is a kind of sameness to hearing so much of this well-known music played exclusively by solo clarinet and strings. The actual opera and the various full-orchestral treatments have a greater array of instrumentation, tone, inflection, and emphases working for them to bring more variety to the music making. Still, taken in small doses, these clarinet transcriptions provide their own rewards. As far as Naxos's sound goes, it's up to their usual standards: good but not quite state-of-the-art. The miking is somewhat close, with the clarinet clearly front and center, producing clean, crisp, dynamic, if not too dimensional results. The audiophile might want more in the way of stage depth and transparency, but I suspect most other people will find the sound satisfying enough. Incidentally, I'd like to mention that Naxos do a terrific job with their booklet notes. They always seem to pack more information into a tinier space than anybody else, the booklet well organized and concise in both English and French. Music for Band by Percy Grainger. Jerry Junkin, Dallas Wind Symphony. Reference Recordings RR-117. Percy Grainger (1882-1961) was an Australian pianist and composer who specialized in collecting and arranging British folk songs largely for band ensembles, integrating many of these songs into his music. Interesting, and as an aside, he also championed an electronic instrument for what he called "free music," emphasizing microtones, "gliding tones," and "free" irregular rhythms, in which he attempted to imitate in sound the swaying of trees, the currents of the sea, and the singing of birds. So Grainger was an innovator from way back. On this disc, however, we get over a dozen of his more popular, more conventional works arranged for wind band, some arranged by him and some arranged by others. For years I've been listening to Grainger's tunes via the old Frederick Fennell Mercury recordings of the late Fifties and Sir Vivian Dunn's EMI recordings of the early Seventies. Both of those conductors lead small, traditional orchestras, though, not a wind and percussion group as Reference recorded here with the Dallas Wind Symphony. Therefore, these wind arrangements, of which Grainger thoroughly approved, were a bit different for me, if not unusual for the composer. Invigorating playing and bracing performances make them of interest to anyone with a fondness for Grainger's music. However, I have to admit that for me a little of Grainger goes a long way, no matter how well it's played. Fortunately, this disc contains enough variety to ward off some of the tedium that can set in when I hear too much of the same. Things begin with "The Duke of Marlborough Fanfare," which is a relatively solemn piece and a bit uncharacteristic of the composer. 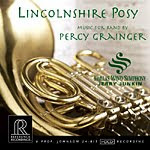 Following that is one of Grainger's more-familiar works, the "Lincolnshire Posy," which lends its name to the album. It's a suite of six tunes varying from brisk to sedate to merry. Ironically, "The Merry King" that follows is anything but merry, being as Grainger wanted it played "flowingly, somewhat waywardly." Then we get a succession of highly popular Grainger pieces like "Mock Morris," "Molly on the Shore," "Lads of Wamphray," "Irish Tune from County Derry" (think "Danny Boy"), and "Shepherd's Hey." In between, there are other pieces, including a lovely tune for wordless chorus called "After-Word." Surprisingly missing from the collection is "Country Gardens," probably Grainger's single most-popular work of all, but it's possible the band and its leader, Jerry Junkin, felt the song was already over exposed. After all, I'm sure there must be a wind arrangement of it somewhere. Reference Recordings capture the sound of the wind band with a fairly heavy acoustic bloom that in all likelihood replicates the group as they actually sounded in a moderately resonant hall like Mererson Symphony Center, Dallas, Texas, where they recorded in 2008. Dynamics are wide, bass is deep, and transient impact is strong. Still, the natural hall reverberation doesn't always allow for the fullest transparency. In all, while Lincolnshire Posy is an intriguing album, I can't say it supplants the two discs I mentioned earlier, which must retain pride of place. Plus Borodin: Symphony No. 2 and Polovtsian Dances. Simon Rattle, Berlin Philharmonic Orchestra. EMI 50999 5 00273 2 3. Needless to say, in order to bring off Modest Mussorgsky's Pictures at an Exhibition successfully, a conductor must exercise a good deal of imagination if he isn't to sound like every other conductor who has ever recorded the work. You would think that if anybody could pull it off, it might be Simon Rattle. But try as I might in repeat listening, I could not quite get into the music on this EMI disc of music with the Berlin Philharmonic. I'm not entirely sure what went wrong here, either with the conductor or with me. I found Rattle rushed when he should have been descriptive and almost lackadaisical when he should have been vigorous. The "Marketplace," for instance, seems more hurried than bustling with energy, his "Baba-Yaga" witch more earthbound than scary, and his "Great Gate of Kiev" more solemn than grand. He follows this with a reading of Borodin's Symphony No. 2 that sounds positively leaden in places, the disc concluding with probably the best of the lot, Borodin's "Polovtsian Dances" from Prince Igor in which Rattle does convey an impressively seductive tone. But for comparison purposes I used Reiner (RCA) and Muti (EMI) for the Pictures and found both of those performances more colorful; Martinon (Decca) for the Borodin Symphony and found it more vital; and Beecham (EMI) for the "Polovtsian Dances" and appreciated its chorus, which Rattle omits. The sound, I read on the back of the jewel box, EMI recorded live in July, 2007. I always have to wonder if the quality of a live recording has anything to do with my appreciation of a performance because, generally speaking, I don't care for live recordings. In this case, the recording has an oddly drab sound, while at the same time being well balanced, with a fine, well-controlled bass impact. At least we're spared any audience applause (or any audience noises of any kind for that matter). The sonics just seem flat, somehow, especially when compared to the recordings I listed above, some of which are almost fifty years older than this one. They all seemed more alive to my ear. Another oddity: The booklet insert that came with the copy of the disc EMI sent me is entirely in German. No English translation. Don't know why. Also, there are no timings listed anywhere, not in the booklet and not on the back cover of the case. I have no idea what the EMI folks are up to here. 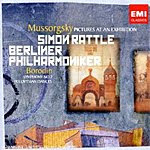 Rattle and the Berlin Philharmonic should be the current jewel in their crown, and it seems to me that unless they sensed something wrong with this issue, they might have done more in promoting it. Sonatore de la Gioiosa Marca; Giuliano Carmignola, violin. Divox Antiqua CDX-79404. 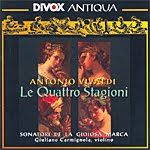 Another month, another recording of Antonio Vivaldi's Le Quattro Stagioni (The Four Seasons). The recordings seem to come more frequently than the actual changes of the year. It's understandable. Vivaldi's Seasons are among the handful of most-recognizable concertos ever written, so we get a plentitude of recordings of them. Not only are there probably a hundred different discs available, they come in a variety of musical styles and ensembles from very small, a handful of players, to medium-sized chamber groups to members of full-scale symphony orchestras; and the performances come on period and modern instruments. There are even transcriptions for flute and for clarinet and for other solo instruments. The choices are endless. In the case of Sonatore de la Gioiosa Marca (a mouthful if there ever was one for such a small band), we get nine performers playing on period instruments in an original 1994 recording remastered by Divox Antiqua in 2008 using 24/96 processing. Although I had never heard the recording before, it apparently has its fans. Sonatore de la Gioiosa is a well-known name among the period-instruments crowd, especially in Europe. The ensemble play with great zest, enthusiasm, and brawny vigor, appearing to delight in the music making. That delight is, after all, the main concern in this music, which aims to describe the seasons of the year complete with chirping birds, murmuring breezes, rustling leaves, thundering weather, baying hounds, glittering snow, chattering teeth, and breaking ice, among many other sounds of nature. The problem I had with the interpretations, though, is that while they are all extremely well played, they all seem alike--fast and loud, with tempos so brisk they tend to rob the music of some of its subtler pictorial qualities. I mean, if the pace isn't sufficiently varied and the emphases not adequately diverse, the music just all sounds the same. At times, Sonatore de la Gioiosa Marca seem positively feverish, which may suit some of the music, to be sure, but not all of it by any means. A good example is "Winter," which should begin with a vivid evocation of the cold, with shivering nerves, icicles, and all. But it doesn't. It just starts with a rush of notes and conjures up little of the wintry scene Vivaldi had in mind. Then, following the opening movement, we get the famous Largo, which ought to be among the sweetest music ever heard, eliciting memories of cozy hearth and home. Instead, here we simply get a jaunty little tune. In a crowded field of contenders, these vigorous performances don't entirely stand up, the readings more straight-ahead than imaginative. Nor does the sound entirely satisfy, despite its near-audiophile processing. It is robust, to be sure, and dynamic, but it, too, seems all of the same cloth, coming across as more flash than nuance. The engineers miked the small group rather closely, so everything is on top of the listener, making for some dramatic but not always realistic sonics nor a very natural acoustic. My own preferences in this warhorse remain unchallenged: Kuijken and La Petite Bande (Sony), Sparf and the Drottningholm Baroque Ensemble (BIS), and Pinnock and the English Concert (DG Archiv) for period-instruments performances; Marriner and the Academy (Decca) and I Solisti Italiani (Denon) for small, modern-instruments performances; and Perlman and members of the LPO (EMI) for a larger-scale modern-instruments performance. As for Sonatori de la Gioiosa Marca, well, it's a competitive field, and, as I say, the recording is mainly for dedicated fans. 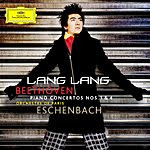 Lang Lang, piano; Christoph Eschenbach, Orchestre de Paris. DG B0008725-02. 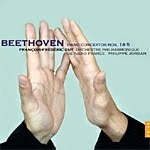 Certainly, Beethoven's Fourth Piano Concerto is more adventurous and more virtuosic than his First, but I have a fond place in my heart for the First, and next to the Fifth it is my favorite of the composer's five piano concertos. Having the earlier Concerto from 1795 alongside the later one from 1808 helps establish the contrasts even more, but I admit still to favoring the earlier, more classical one. Anyway, the Fourth is probably the better vehicle for showing off young Chinese pianist Lang Lang's prodigious abilities at the piano, although I preferred him in the quieter passages of both pieces. In No. 1, for instance, we get a big, rhythmic opening movement and a playfully tuneful closing movement, with one of the most tranquil, meditative middle movements a listener could imagine; and Lang plays it as refreshingly sweet as one could wish. Not that the grander outer movements of either concerto are lacking, understand, but they don't quite match the beauty of Lang's playing in the slow sections. For the person looking for a new digital recording of Nos. 1 and 4, I would have little hesitation recommending Lang Lang's new effort. However, be aware that for even less money, one can buy the two-disc set of Kovacevich playing Nos. 1-4 with Davis and the LSO on a Philips Duo. Kovacevich's recordings may be part of a much-older analogue set, but they compare more than favorably with this newer release in every way. William T. Stromberg, Moscow Symphony Orchestra and Chorus. Naxos 8.570185. Every day in every way, they're getting better and better. The budget-priced Naxos label is reissuing many of Marco Polo's full-priced recordings, including many of film scores. The Marco Polo discs were worth the money, and now the Naxos reissues make things even easier on the buyer. 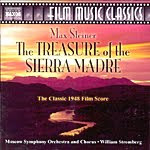 For those of you, like me, who love old movies, the reconstructed scores have been godsends; but with the restoration of Max Steiner's music for the 1948 John Huston classic, The Treasure of the Sierra Madre, Naxos/Marco Polo have outdone themselves. This may be the best movie music recorded in the past few decades, it's that good, and it's an album I have fallen in love with. The film, of course, is an adaptation of B. Traven's novel of greedy gold prospectors in Old Mexico, starring Humphrey Bogart in his most startling role as the paranoid Fred C. Dobbs, with Walter Huston (the director's father) and Tim Holt as his partners. The film won Academy Awards for Best Direction and Screenplay, and Walter Huston won for Best Supporting Actor. Anyone familiar with the story, and that's probably everyone reading this review, knows the plot (although I have the feeling that people younger than twenty tend to think that any film predating themselves is an old-time movie not worthy of their consideration and that anything made in black-and-white is ancient history). Listening to Steiner's score, restored by John Morgan, the man responsible for many other Naxos-Marco Polo efforts, one can picture every detail of the story line and hear it in some of the best sound ever heard in this music (from the seemingly unlikely source of the Moscow Symphony Orchestra and Chorus). I delighted in every minute of it. But I will not go on at length describing the "Windstorm" or "Bandits, Outnumbered, Federales" or "The Ruins" or the marvelously evocative "Texas Memories." I suggest you just listen for yourself. With over an hour of music, the album also includes three bonus tracks--music for the theatrical trailer, an alternate Main Title, and an alternate Finale. Trivia notes: If Bogart's fedora in the movie looks familiar, think of Indiana Jones; it was Spielberg's inspiration. And if you are tired of hearing Alfonso Bedoya's famous words misquoted time and again, here they are verbatim: "Badges? We ain't got no badges. We don't need no badges. I don't have to show you any stinkin' badges!" Herbert von Karajan, Berlin Philharmonic Orchestra. EMI 0946 3 81798 2. There was a time in the 1950s, 60s, 70s, and 80s that Herbert von Karajan was among the most recognized conductors in the world through his work with DG and EMI, and his orchestra, the Berlin Philharmonic, was among the greatest that ever played. Times change. The orchestra continues to perform well, but Karajan's name may be fading. Not that EMI or DG want the name to disappear. They have a ton of old material they have been reissuing since the man's death in 1989, as these late Tchaikovsky symphony recordings testify. 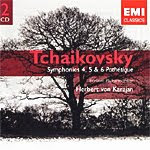 To my knowledge Karajan recorded the Tchaikovsky Fourth, Fifth, and Sixth at least three times in stereo, twice for DG and once, here, for EMI. He may have even recorded them four times in stereo, but I don't recall. Doesn't matter, really. The performances seem pretty much the same. Still, these from EMI in 1972 are probably the best recorded. Here's the thing, though: You'll either find the interpretations intensely exciting or breathlessly hard-driven. I tend to find them in the latter category. Yes, they will get the adrenaline running, but, no, they might not reach out to your heart. Karajan was often criticized for glamorizing the music he made. Here, he doesn't so much glamorize it as push it too hard. Of the three works in this two-disc set, I enjoyed the Fifth the most, but even here I found the conductor missing some of the work's inner drama in favor of outward show. Still, one could do worse, and at the price these readings are worth hearing. The only unfortunate aspect of the set is having to divide the Fifth Symphony between two discs. The sound is at once appealing and not. The sonics are quite dynamic, with a huge impact and pretty good orchestral depth. But things tend to get a bit shrill in the biggest climaxes, and deepest bass is noticeably absent. I compared a copy of Riccardo Muti's Tchaikovsky on EMI from the same era, a few years later with the Philharmonia Orchestra, and found the sound quite a bit smoother. I wish EMI would rerelease that set. Benjamin Britten: The Young Person's Guide to the Orchestra; Sinfonia da requiem; Peter Grimes: Four Sea Interludes & Passacaglia. Michael Stern, Kansas City Symphony. Reference Recordings RR-120. Some years ago when Reference Recordings came out with their disc of Rachmaninoff Symphonic Dances, I wondered why the company would want to go head-to-head with Andre Previn's well-received EMI recording of several decades before. Now, in 2009, I wondered the same thing as RR released an album of Benjamin Britten's music, two of the items--the Sinfonia da requiem and the Sea Interludes--having again already been notably recorded by Andre Previn and the third item recorded by the composer himself. I suppose I should not have been concerned. In terms of program content, interpretations, and sonics, the Reference Recordings disc is different enough to assuage any doubts about their comparative worth. 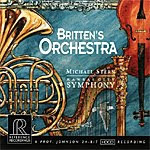 On this album, RR offer three of Britten's most-popular orchestral works, starting with what is possibly his most well-known music, The Young Person's Guide to the Orchestra. Britten wrote what was initially called The Instruments of the Orchestra at the request of the Ministry of Education for a school children's film premiered in 1946, and he based his music on a hornpipe theme from 1695 by Henry Purcell. The idea was to highlight and showcase each family of instruments in a symphony orchestra in order to acquaint youngsters with them. The Purcell variations may seem overly simple to some listeners and perhaps even clumsily constructed, but they hit a chord with the public and continue to make for delightful listening. The music is easily accessible, filled with memorable plenty of warmth and played by Michael Stern and the Kansas City Symphony with great affection and enthusiasm. Not only does the music showcase the instruments of the orchestra, it showcases the talents of the K.C. players. However, I wouldn't say Stern's performance eclipses that of the composer himself in his 1963 Decca recording, which is still the definitive version, making Stern seem almost lax by comparison. While Britten's rendering crackles with energy, Stern is merely competent. Moreover, the old Decca continues to sound awfully good, too, albeit in a glossier, more "hi-fi" sort of way rather than in the purely lifelike way of the Reference Recordings disc. Next up, we get the Sinfonia da requiem, Britten's first purely orchestral work without a soloist and written at the request of the Japanese government in 1940 to commemorate the 2,600th anniversary of the Japanese dynasty. When the Japanese heard it, though, they felt offended by Britten's pacifist Christian references in the piece and rejected it. That was for the best, of course, since within a year Japan was at war with England. John Barbirolli premiered the work with the New York Philharmonic in 1941, and it's been going strong ever since. Here, Stern plays the first movement Lacrymosa rather briskly, slightly lessening its cries of grief. Fortunately, the second movement Dies irae and third movement Requiem aeternam more than make up for it with their intensity and repose, respectively. Then there are the Four Sea Interludes and the Passacaglia from Britten's 1944 opera Peter Grimes. Taken as a group, these brief tone poems make a familiar suite of atmospheric music similar to Debussy's La Mer. The unusual element here is that in this order of things, we find the Passacaglia in the fourth position, after "Dawn," "Sunday Morning," and "Moonlight" and before "Storm," which ends the piece. More commonly, conductors place the Passacaglia (a slow, dignified dance of Spanish origin) last, where it allows the suite to finish on a tranquil note. Concluding with the "Storm" tends to help the whole thing wrap up with a bang, but it doesn't quite feel right, sort of like hearing Beethoven's "Pastoral" Symphony closing with the tumultuous storm section. In any case, with a CD player listeners can rearrange the movements in any sequence they want. As far as comparisons to the aforementioned Previn EMI recordings are concerned, maybe it's because I've lived with them for so long, it's hard to readily accept other versions. I continue to think Previn is more incisive than Stern in the Sinfonia and more evocative in the Sea Interludes. Where Stern scores is in the sheer vigor and dynamism of his brawnier performances. And where the RR recording scores is in the realism of its sound. Not that Previn's EMI recordings in particular are any slouches (they are, indeed, excellent by any standard), but the sonics on the RR disc are just that much better: Big, warm, and smooth, with no trace of edginess, glassiness, or glare. As usual from this source, there is also a fine depth of field, more than we find in the EMIs, plus remarkable impact, wide dynamics, deep deep bass, and a quick, crisp transient response. In addition, we get a fairly lucid midrange, not quite as thickly reverberant as with some Reference Recordings, with yet a natural hall bloom that reminds one of being in the audience for a live concert performance. The HDCD recording under the guidance of engineer Keith Johnson lives up to the name of the company that makes it: It truly is an audiophile reference recording. Incidentally, for those who appreciate such things, the cover art is quite fetching and Richard Freed's booklet notes are illuminating. Every little bit works to complement the whole. Federico Guglielmo, L'Arte dell'Arco. CPO CD/SACD 777 312-2. Everybody is striving for authenticity these days, but in the case of Handel's Water Music and Music for the Royal Fireworks, nobody quite gets it right. This is probably because Handel didn't leave us detailed notes on the music or because he changed things so often. In any case, Federico Guglielmo and his L'Arte dell'Arco players come about as close as anybody, producing a good all-around recommendation in this coupling. Things begin with the Water Music, where we usually get two or three suites of movements. Well, it turns out, the suites are a relatively recent concoction. Guglielmo plays the various movements in the order they are found in the earliest known manuscript, dating back to 1719. So instead of two or three arrangements, we get a single, forty-nine-minute succession of movements. Of course, Guglielmo's players perform on period instruments and adhere as closely as possible to what researchers today consider period-performance practices. The results in both the Water Music and the Fireworks music are invigorating, but the tempos are never too fast to be breathless. Still, as I said, nobody gets it quite right. Contemporary accounts of the première performance of the Water Music describe about fifty players participating and in the Fireworks music about one hundred or more. The booklet insert lists only seventeen players in the L'Arte dell-Arco, and in the picture of them, there are only a dozen. So, in terms of sheer size, L'Arte dell-Arco can't match the sheer numbers Handel had at his disposal for the inaugural presentations of these works. But as Guglielmo says, most subsequent performances and most court orchestras did not employ anywhere near these numbers, so Guglielmo's small group can get away with reasonably imitating Handel on a less grand scale. And, naturally, there is a upside to a small ensemble: They sound more transparent than a big orchestra would. This CPO recording is clear, clean, and dynamic, the sonics among the better I've heard in these works. The CPO engineers capture the band in a spacious auditorium that makes them sound like a bigger group than they are, while at the same time not beclouding the acoustics in any way. What's more, for listeners equipped with multichannel SACD playback, the disc is a hybrid CD/SACD, playable in 2.0 or 5.1 channels in SACD and 2.0 channels on a regular CD player. I compared the playback of the two-channel stereo tracks in CD and SACD and couldn't hear much difference, but, then, I didn't have access to two separate players and two separate discs for instant comparisons. In the thirty seconds or so it took to change disc layers, I may have forgotten any differences there may have been. In any case, good, lively performances on period instruments and good, lucid sound make this disc a contender. Erich Kunzel, Cincinnati Pops Orchestra. Telarc CD-80703. I read someplace that Erich Kunzel was the number-one most-recorded conductor in the world. And that was, like, ten or fifteen years ago! Today, he's undoubtedly got as many Telarc recordings to his credit as most conductors have compiled in a lifetime. The back page of the disc's booklet insert lists Kunzel's Telarc recordings, and you have to use a magnifying glass to read them all. 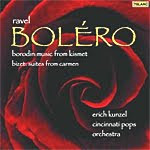 This latest release is "Bolero," a disc dedicated to the music of exotic lands. It starts with Ravel's celebrated piece, yet it is the least-effective reading on the album. Ravel once said that his Bolero should take about seventeen minutes to get through; Kunzel does it up in just over thirteen minutes. I have to admit that in Kunzel's last few Telarc recordings with the Cincinnati Pops, he seemed less than animated, but I wasn't expecting him to fly through the Bolero quite so quickly. It may sound a bit more exhilarating than most other interpretations, but it robs the music of its sensual qualities. Plus, there was one moment in it that made me laugh out loud, something I doubt Ravel intended. Next, Kunzel does a medley of excerpts from the music of Alexander Borodin, music which the album proudly announces as "popularized in Kismet." I'm not sure if Telarc or Kunzel realize that most listeners today probably no more recognize this fifty-odd-year-old musical than they recognize the name Borodin itself. In any case, we get passages from the Symphony No. 2, "In the Steppes of Central Asia," the String Quartet No. 2, the Symphony No. 1, and the Overture and "Polovtsean Dances" from Prince Igor. Kunzel handles them in his usual perfunctory style. The best section of the album, however, is devoted to the music of Georges Bizet's Carmen, the Suites Nos. 1 and 2, which come off quite well--dramatic and voluptuous, exciting and sensitive in all the right places. You might want to consider the disc for these two suites alone. Then things finish up with Isaac Albeniz's "Fete-dieu a Seville" from Iberia, which seems a bit anticlimactic after the Carmen music, but it's OK.
Telarc's sound is quite good. It is especially impressive in its spatiality, naturalness, and ultra smoothness. I thought the top end seemed a little recessed, though, especially compared to a number of other recordings to which I compared it. So don't expect too much glamor in the highs, just a sweet sonic realism throughout the rest of the range. Rimsky-Korsakov: Capriccio Espagnol; Granados: Andaluza, Danza Espanola No. 5; Chabrier: Espana; Moszkowski: Five Spanish Dances. Ataulfo Argenta, London Symphony Orchestra. LIM XR24 016. 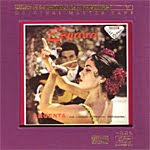 Originally recorded by Decca in 1956, this classic album, "Espana," with conductor Ataulfo Argenta has the distinction of being one of the best collections of Spanish-inflected music ever produced. Yet, of the four composers represented, only one is actually Spanish. No matter. You don't have to be American to enjoy a hot dog. The Russian, German, and French composers do just as well by the music as the Spaniard. Things begin with Nikolai Rimsky-Korsakov's Capriccio Espagnol, a lively, colorful piece that has seen hundreds of interpretations but none quite so affecting as this one. On a rival XRCD from JVC, Kiril Kondrashin directs a more flamboyant, more purely exciting account, but Argenta imbues the music with an enjoyably relaxed tone. Not that the big, dramatic moments don't come to the fore under Argenta; they do. But he captures the lighter, more reflective interludes as well. Following the Capriccio is Enrique Granados's brief Andaluza, Danza Espanola No. 5, which comes almost as a lullaby after Rimsky-Korsakov's more-explosive, more-ornate work. Then there is probably the most-famous piece of Spanish music ever written, Espana, by the Frenchman Emmanuel Chabrier. No complaints here; Argenta's reading is one of the two or three best, most evocative available, and, ironically, the best recorded. Finally, there are Five Spanish Dances by Moritz Moszkowski, all of them quite lovingly executed by Argenta. This particular album has been a showpiece for hi-fi systems since the earliest days of stereo, and the last time I recommended it (about a dozen years ago in the $ensible Sound magazine), it had been remastered on a gold disc by Classic Compact Discs. It sounded very, very good, and now LIM (Lasting Impression Music, the Decca remastering arm of producer Winston Ma's First Impression Music) have given it the ultimate treatment in XRCD 24-bit processing. In a direct comparison of the XRCD with the gold disc, I found small but noticeable improvements in the XRCD's handling of mid-to-upper bass, resulting in a warmer, smoother, and, most importantly, fuller sound. The gold disc seemed a tad lean to me by comparison, and a touch edgier. Not that the gold presentation isn't still a great-sounding disc; it's just that the XRCD appears to my ears to be slightly richer and more realistic. I suppose one could argue about which disc produces the widest dynamic range and the strongest impact, but these are areas too close for me call. In any case, the Classic Compact gold disc is no longer available, so the point is moot unless you already own it. If you like this music and you like this album, you can't beat the LIM XRCD remastering of it. Just be sure you have the deep pockets to pay for it, because it will cost you as much as any gold disc ever would. Eiji Oue, Minnesota Orchestra. Reference Recordings RR-96CD. When Reference Recordings made this album in 2001, I remember it surprised me somewhat because I thought as they were an audiophile label they were quite well aware of Andre Previn's celebrated analogue recording of Rachmaninoff's Symphonic Dances. I wondered why they would want to compete against a recording that most audiophiles would already have in their collections. Unless, of course, they thought their own version would be superior in performance and/or sound. I shouldn't have questioned their reasoning. Conductor Eiji Oue's interpretation is neither inferior nor superior to Previn's but, rather, a complement to it. Where Previn emphasizes the "dance" qualities of the work, the sweet, light, lyrical aspects, Oue is more interested in the "symphonic" elements. That is, his reading is grander, more imposing than Previn's, with more accentuation on the strong, powerful factors in the music. The three-movement Symphonic Dances was Rachmaninoff's final composition, premiered in 1941, just a couple of years before his death. Rachmaninoff's friend, choreographer Mikhail Fokine, told him that above all the music should have vitality and character. Certainly, it has that in spades, whether the conductor is stressing the lyrical dance components or the purely symphonic ones as Oue does. Vitality is Oue's strong suit, especially in the big opening movement and the even bigger closing segment. In between, there is the Andante, a slightly eerie, sometimes demonic, sometimes sweet waltz, which Oue also brings off well, with plenty of "character." The final movement is massive in scope, battering the door for a quarter of an hour with only momentary hushes. Filling out the disc is, first, the little Vocalise, originally a composition for wordless voice and piano that Rachmaninoff wrote in 1912 and later transcribed for orchestra, the version we have here. It's a lovely work, not quickly forgotten, which Oue takes perhaps a bit too literally, diminishing some of its grace and beauty. Closing the program are the composer's five Etudes-Tableaux, piano pieces that Rachmaninoff wrote in 1911 and 1917, here transcribed for orchestra by Ottorino Respighi, he of Pines, Fountains, and Festivals of Rome fame. Respighi was obviously no stranger to evocative tone poems, and he asked Rachmaninoff for descriptions of the music. 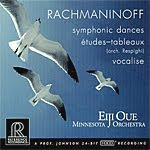 It does not appear that Rachmaninoff was too keen on the idea of pictorial music and at first hesitated; but eventually he said the five works represented "The Sea and Seagulls," "The Fair," a "Funeral March," "Little Red Riding Hood and the Wolf," and an oriental "March." Well, OK. The last three pieces do, indeed, sound like the descriptions the composer gave for them, although there is little in the first two pieces to justify the titles. I suspect the composer simply made up some of the descriptions on the spur of the moment to satisfy Respighi's request. In any case, the melodies are quite colorful, charming, and exciting by turns. Just as stunning as the music is Reference Recordings' sound. This is true demonstration fare, starting with the wide dynamic range and strong dynamic impact and proceeding to the excellent orchestral depth, the room-filling ambiance, the natural-sounding midrange, the sparkling highs, and the thundering lows. This is master-tape audio, full, effulgent, resplendent, a little thick and not entirely transparent but realistic in the extreme. Bravo! Julia Fischer, violin; Academy of St. Martin in the Fields. Decca B0012490-02. In 2003, DG released the Bach Violin Concertos played by the talented young female violinist Hilary Hahn, accompanied by the Los Angeles Chamber Orchestra. 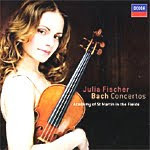 In 2009, Decca released the same four Bach Concertos played by another talented young female performer, Julia Fischer, accompanied by the Academy of St. Martin in the Fields. Each album contains the pair of Violin Concertos, BWV 1041 and 1042, the Concerto for Two Violins, BWV 1043, and the Concerto for Oboe and Violin, BWV 1060. Comparisons became inevitable. A glance at the timings for the two Violin Concertos shows that they are within a few seconds of one another. But on closer inspection, one notices that Ms. Fischer is fractionally slower in the fast movements than Ms. Hahn and a hair faster in the slow movements. It doesn't make a lot of difference except that if you play them side-by-side, switching instantly from one to another, it does appear that Ms. Hahn is the zippier of the two, which may or may not impress you. Some listeners will find Ms. Fischer's interpretations more relaxed and more refined. Other listeners, like myself, will find Ms. Hahn imparting a marginally greater sense of fun and joy to the music. Although, for that part, both musicians seem to be enjoying themselves and the music immensely. This is not your parents' Bach. In terms of sound, it's almost a toss-up as well. The DG recording is a tad softer and warmer than the Decca, yet it feels a bit more solid, too. The Decca is just that much glassier and wispier. The preference here may depend upon one's playback equipment, the tonal balance of one's speakers, especially. There is one area in which Ms. Fischer is the clear winner, though. She has more pictures of herself in the packaging, nine for her to eight for Ms. Hahn. One small step for Ms. Fischer. Leonard Slatkin, BBC Concert Orchestra. Naxos 8.559356. 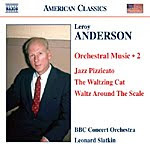 American composer Leroy Anderson (1908-1975) was primarily a miniaturist who created tiny, descriptive tone poems that perfectly encapsulated a time, a place, or an event. When you listen to his work, you say to yourself, "Wait. I know that. Did he write that, too?" There are sixteen pieces of music on this disc, the longest lasting twelve minutes, most of them lasting no more than four or five minutes, and you marvel at the man's ingenuity and sense of fun. Of course, many of Anderson's most-famous works are on Volume 1, but there are still enough good things left over to fill out this budget-priced Naxos disc. Some of the music is more serious than others, of course. Things like "Song of Jupiter," for instance, is a rearrangement of Handel by way of Elgar, while other pieces flirt with familiar jazz idioms, like "Jazz Legato" or "Jazz Pizzicato." But mostly his works are little showpieces, and you'll instantly know them when you hear the first few notes. Pieces like "Horse and Buggy," "Whistling Kettle," "Home Stretch," and "The Waltzing Cat" are guaranteed to bring a smile to your face. Leonard Slatkin performs these pieces with the BBC Concert Orchestra, and he does a fine job with them, even if he doesn't quite match Frederick Fennell for sheer élan on the old Mercury recording of more than half a century earlier. The Slatkin performances are competent without being absolutely riveting. The sound, too, is good without being top drawer. It lacks a little something in transparency and dynamic impact, but, again, my comparison was the old Mercury recording, which is hard to beat by any standards. Mendelssohn: Violin Concerto, etc. Nicola Benedetti, violin; James MacMillan, Academy of St. Martin-in-the-Fields. DG B0007682-02. It's hard to say which is lovelier: The music, the performance of the music, or the performer of the music. 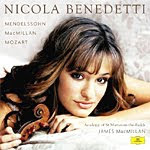 It doesn't hurt Nicola Benedetti's chances for success that she is both talented and attractive. Indeed, the combination seems to be a prerequisite for any female violinist these days. That said, I have to admit I was not entirely won over by everything on the disc. 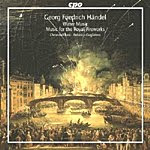 The album's focus is the opening work, Mendelssohn's Violin Concerto in E minor, which lacks an essential brilliance and bubbly effulgence in its opening and closing movements, despite Ms. Benedetti taking them at a healthy clip. This may be due in part, however, to DG's rather prosaic sound, which tends to undermine any radiance the performer tries to produce. The sound is not bad, mind you, just mediocre; it hasn't a lot of body or bass or dimension or transparency. Because the sound is merely competent, not great, the performance is not quite a contender since it takes something more than mere competence to compete nowadays in a crowded field. Anyhow, Benedetti and DG do much better with the Concerto's middle movement, where DG's sonics make a more comfortable fit with the lyrical, relaxed, Romantic atmosphere of the Andante than they do with the opening Allegro and closing Allegretto. Ms. Benedetti also shines in the accompanying shorter pieces: Mozart's Adagio for Violin and Orchestra and Rondo for Violin and Orchestra, and Schubert's Serenade (D957) and Ave Maria (D839), which are quite easygoing and moving. Things conclude with new commissions from conductor-composer James MacMillan, several brief excerpts from Ayshire, an area of Scotland where MacMillan was born and raised and which is not far from Benedetti's family home. The first Ayshire piece is a slightly melancholy evocation of the Scottish landscape, followed by a more raucous bit that doesn't quite comport with the other segment. Still, Ms. Benedetti seems fond enough of both pieces to present them affectionately enough. 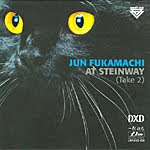 Jun Fukamachi, piano. LIM DXD 038. Record producer Winston Ma has been releasing LPs and CDs in various audiophile formats over the years from Golden String to First Impression Music, from gold discs to XRCDs and K2 HDs. He never seems to tire of experimenting, always looking for the best possible medium of music reproduction at any cost. Now, we get one of his latest dreams. He explains in this disc's booklet notes that "Direct cut LP...has the most breathtaking dynamic contrast and richest musicality, combined with stunning presence and definition." That's right, a quarter century into the CD age, he admits that vinyl records still sound best to him. That's why he decided to make this latest CD recording of an LP. Huh? Yes, he has recorded an LP directly to CD, using no master tapes. The record he used is what he considers the best-sounding LP in his experience, "Jun Fukamachi at Steinway," a Toshiba-EMI direct-cut recording from around 1978, taken from the only brand-new copy known currently to exist, on loan from Toshiba-EMI's own studio library. Using the latest state-of-the-art technology (DXD, Digital eXtreme Definition), recording and mastering engineer Bruce Brown meticulously transferred the sound of the "Fukamachi" LP to CD using two separate phono cartridges, turntables, and tonearms for comparison purposes. This may be the ultimate audiophile CD of all time because you get to hear the same recording played back through two of today's top pickups--a van den Hul Colibri XC-HO and an FIM Black Ebony One; five tracks recorded twice each for ten tracks in all. Four tracks are from the "Fukamachi" LP: Chopin's Nocturne in E Flat Major and Fukamachi's own "Just Driving You Crazy," "Ran-Ran," and "Don't Shoot Me, I'm Only the Messenger"; plus a bonus track of Lennon and McCarthy's "Day Tripper" from the album "Super Strings" by the Tokyo Strings Ensemble, conducted by Tsugio Tokunaga. The total length of the disc is fifty-five minutes, but since everything is repeated twice, it's really about twenty-seven minutes of actual musical content. OK, I said it's an ultimate audiophile recording because it's the kind of disc that isn't primarily intended for musical listening. Oh, the music is all right, but there isn't much of it, and it varies so much, there is little continuity to it. No, this is a disc for demonstrating to yourself and to other audiophile friends what pure sound is all about. It is for convincing people that LPs really do sound better than most CDs. It's for arguing about which of the two cartridges used for playback is better. That kind of thing. You know: The stuff that audiophiles dream of and live for. The first thing I noticed about the sound is that it is, indeed, terrific. It is probably the best piano recording I've ever heard. I just wish it were, like, sixty full minutes of Chopin Nocturnes or something worth sitting down and actually listening to as music instead of just sound. The dynamics are, as Winston says, strong and wide; the definition is superb, startling, in fact, in its clarity; and the sonics are perfectly natural, perfectly realistic, with no harsh overtones, no glassiness, no edge. The next thing I noticed was that the two cartridges do sound different, if only so slightly. Right off, I noticed that the Black Ebony was louder than the van den Hul; measuring the first few notes of the first two comparison tracks with a sound-level meter, I found the Black Ebony about four or five decibels louder. So, if you're going to make comparisons, adjust for volume. Next, I noticed in the program notes that each of the comparison tracks differs in length by several seconds. The Nocturne as played back on the van den Hul, for instance, is 11:22 minutes and on the Black Ebony 11:04. I'm not sure what to make of this. Either one turntable is running at a very slightly different speed than the other, or the timings were simply measured differently. As far as a preference between the two cartridges is concerned, I leave that to dedicated audiophiles to argue. I thought the Black Ebony was the tiniest bit warmer than the van den Hul, with a touch fuller bass, but I didn't go back and forth enough times to determine the matter to my satisfaction. Let's just say they are different and leave it at that. The kick, though, is the nostalgia factor. I haven't listened to an LP in years, and it was kind of fun to hear the needle plunk down on the vinyl surface, hear a momentary pre-echo, and then hear the occasional soft ticks and pops, even from a brand-new LP. Ah, those were the days. And, I guess, still are. Now, if Winston is going to do anything further with this idea of transferring records to CD, I hope he choses a few albums of more extended musical play, with more content a person can actually listen to. Also, you're probably wondering how much this disc is going to set you back. Well, it ain't cheap. Again quoting Winston from the disc's booklet notes: "We offer 3 editions of this special production: Regular DXD CD, at K2 HD price, boasting higher definition quality; Collector's Edition with RCC (Resonant Control Coating), and washed with deionized cleaning solution, at a higher price. Very limited Direct-from-Master Edition 24k Gold with RCC, deionized solution washed and dynamically balanced, at a premium price." Heaven only knows what that "premium price" is; I didn't have the guts to look on FIM's Web site to find out. But I know it won't be too much for the audiophile in search of absolute, transcendent sonic purity, perceived or otherwise. Robert Spano, Atlanta Symphony Orchestra. Telarc SACD-60696. If you can get by the pretentious, New Age-sounding title, you may find composer Michael Gandolfi's music interesting in a fragmented sort of way. Gandolfi found his inspiration in a real-life Scottish garden that tries to represent the newest scientific theories about the mysteries of the universe in its flowers, hills, and terraces: the Big Bang, superstring theory, wave theory, subatomic particles, DNA, etc. What Gandolfi does is attempt to transpose those visual symbols into aural, musical ones. The result is a mixed bag, to say the least. Like the garden, which is ever changing, the music is in segments that can be rearranged, added to, or subtracted from however its performers decide. 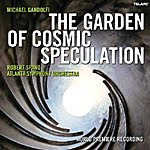 In the case of the present disc, a world-première recording, conductor Robert Spano chose to offer up a three-movement suite of sixteen sections, with names like "The Zeroroom," "Soliton Waves," "The Snail and the Poetics of Going Slow," "The Universe Cascade," "The Garden of Senses," "Fractal Terrace," "The quark Walk," and other such descriptive monikers. The problem is that apart from each piece of music trying its best to represent some esoteric theory of physics, the whole thing reminded me of the soundtrack to Disney's old movie, "The Black Hole." Not that that's bad, you understand. There is a lot of fascinating music here, in styles that range everywhere from ninth-century chants through Bach to Steve Reich to modern cacophony. And it begins and ends where every good garden should begin and end, with the sounds of birds gaily tootling in the distance. I suppose we're to take it all seriously, but I couldn't help finding it more than a bit whimsical. Telarc sent me two discs to review, this hybrid SACD and a regular CD edition, so I had a chance to play the SACD two-channel layer and the regular CD two-channel version side-by-side in separate machines for instant comparisons. I confess I could hear little or no difference through my bi-amped VMPS RM40 speakers. Perhaps the SACD sounded a tad more open and dynamic, but it might simply have been my imagination. In any case, if you have a 5.1 channel setup, you'll get the benefit of the SACD's multichannel playback. What's more, no matter which layer you play, you'll get some pretty decent and typically "Telarc" sound, with good imaging, good impact, good stereo spread, and good midrange clarity. So, the disc offers some unusual if somewhat lightweight music in pleasant, modern digital sound.